I had a difficult time with the letter C. I couldn’t decide which cradle board to show, so I’ll show you several. We have 2 actual baby sized cradle baskets in the collection. Both are from the Hoopa in northern California. Here are Cleora Helbing’s notes on the larger of the two: “This natural-colored basket, 26 inches long and 12 inches wide, was used to carry the Indian baby, either by cradling the basket with the baby tied into it, in the arms or on the back, or, when the mother was working, by hanging baby and basket on a tree. Notice the loop in the handle which allows the basket to be hung. The basket was made from willow, after the bark had been stripped with the teeth. This basket carried the three sons of Delia Carpenter, a Hoopa. Calvin, one of the sons, was born in 1920. The basket was made by his grandmother, Kity Spot. 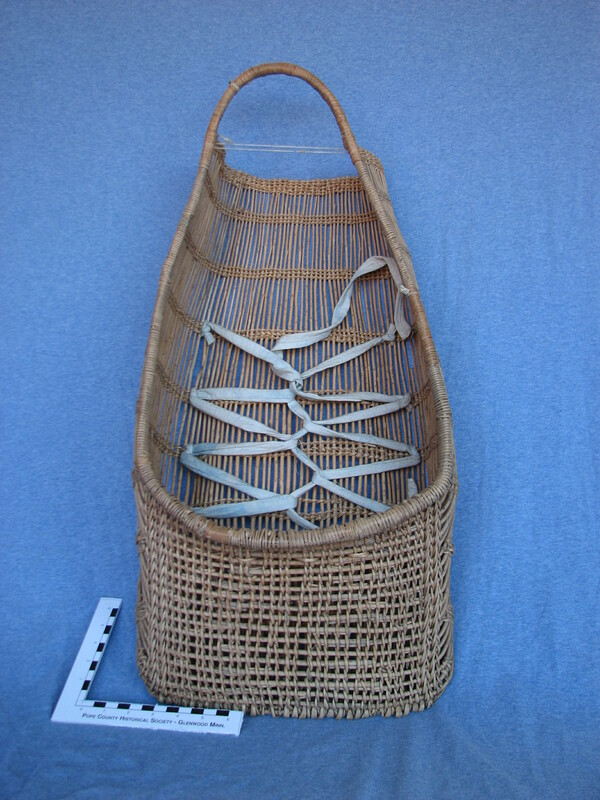 She was a dear old soul.” The baby would be strapped in securely using the cotton ties in a sitting position, with his bottom on the open weave section on the bottom of the basket and with his legs dangling over the edg e. The open weave section at the bottom of the basket could be filled with absorbent plant materials. 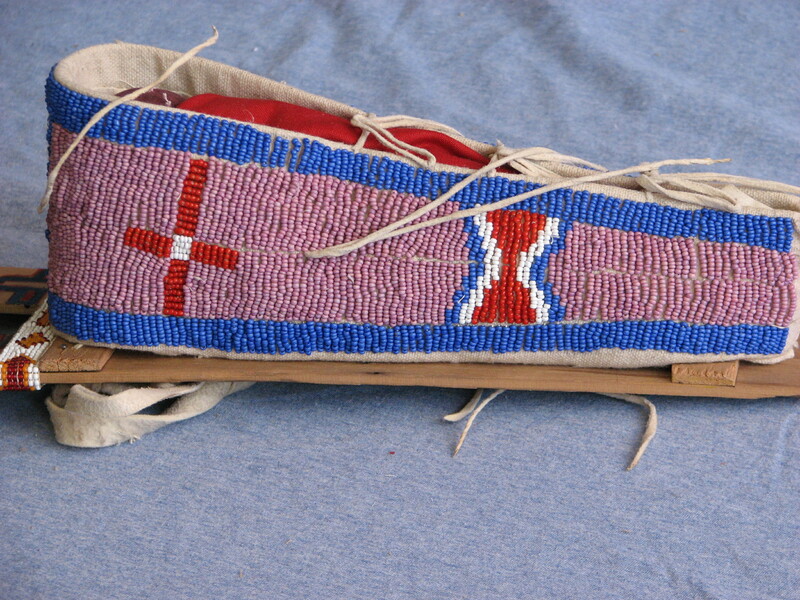 A note on the back reads: “Made by Birdie Toppet Age 13 Kiowa Indian. 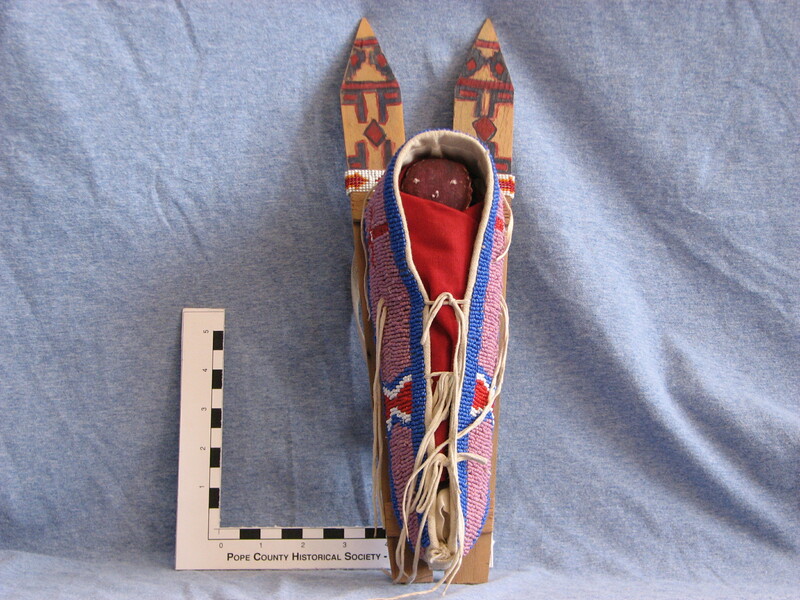 Teacher – Mrs. Mary Inkanish” Mary Inkanish made the buckskin dress for Cleora. This entry was posted in Collection Notes and tagged A-Z, Cleora Helbing, cradle basket, hoopa, hupa, museum collection, Native American art. Bookmark the permalink.